I come from Guinea Conakry and left the country three years ago. It was a combination of ethnic issues, political problems, insecurity and poverty that made me want to leave. My family’s poor and we didn’t have enough money to feed ourselves. We didn’t really have anything, we couldn’t pay our rent and we faced health problems. When I left my family I cried because I didn’t know if I’d ever see them or my country ever again. I set off on a journey which took me to Bamako in Mali. 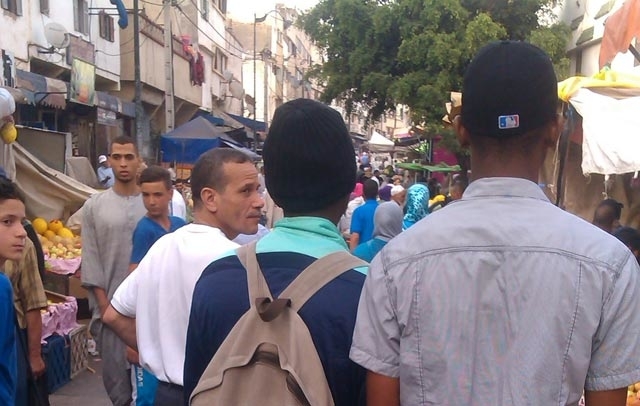 There I met a man who told me there was a way to get to Morocco, from where I could go to Europe. I wasn’t sure about going but he convinced me because he said he knew the way to get there. We went to Gao, a town in central Mali so we could set off on our journey across the desert. There we found men with scarves wrapped around their faces and heads with people from various countries such as Senegal, Ivory Coast and also from Guinea. These men put us on a big truck which took us towards Kidal, which is the base of the Tuaregs. We were in the desert for four days with some water canisters and some biscuits which didn’t last very long. We were attacked by the Tuaregs at a certain point. They made us get out of the truck and they made us line up and one by one take out our phones and all our money to give to them. On the afternoon of the fourth day we arrived at the Algerian border. The smuggler had to negotiate with the border guards to get us in to the country. They took us to a house were the conditions were really bad. Even breathing was difficult. Me and my friend got some work on a building site while we were there but after a while we managed to cross into Morocco at Oujda. I joined a group of other people who were led by a guide and we arrived at Nador. This is where there is a border with (the Spanish enclave of) Melilla, surrounded by fences covered in barbed wire. I hoped I could enter Europe. We organised ourselves to force our way across the fence. On the 5th day, with the guide, we tried to jump the fences, this is where I broke my foot, the Moroccan militaries were throwing rocks at us. The militaries had wooden sticks, this is what they were beating the people with. They beat the arms, the feet and really hurt people. An ambulance came and took those of us who were injured to Hassani Nador hospital. It would have been difficult to operate on my foot so the doctors put a cast on my foot without operating. Caritas supported me for two years until I could be operated on. Now I am healthy, I can walk well and I’m very happy that they’ve helped me and many other migrants in Morocco.